Fruit Custard is a version of fruit salad. Well you can call this recipe a fruit salad too. 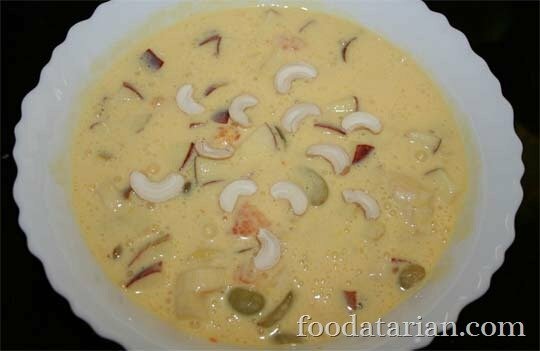 I have added fruits to the custard and garnished with dry fruits and cream. 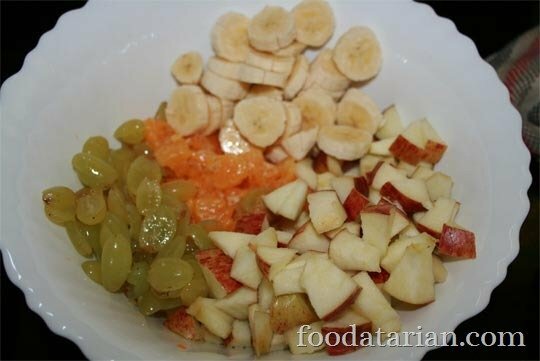 It can be served as a dessert as well as a good way to make your kids eat fruits. I would not say a healthy one, because fruits are to be eaten in their whole form to get maximum nutrients. But this way you can at least get your kids to eat some fruits. Take a cup of cold milk and add custard powder to it. Mix until a paste in formed. Bring remaining milk to boil. Add sugar while boiling the milk. Once the milk boils, reduce the flame to minimum and add the paste to it. Stir or mix using a whisk instantly and continue to mix the custard else lumps would be formed. Cook the custard for 3-4 minutes and remove from flame. Let the custard come to room temperature. Then using a hand blender or a mixer grinder, blend the custard into a smooth paste. Then chill it in the refrigerator. Chill the chopped fruits in the refrigerator until ready to serve. 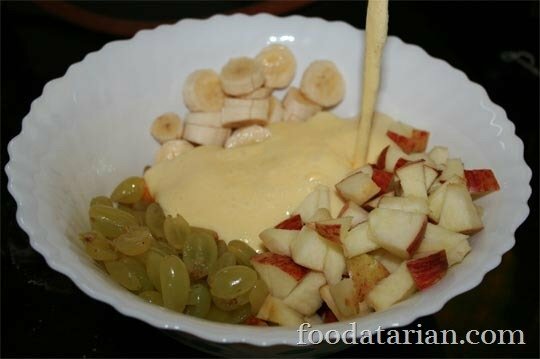 While serving, combine fruits with custard, garnish with cashew nuts and cream. 1. Avoid using sour fruits like kiwi, cherries, etc in the custard as they may spoil the taste. 2. Chop apples and bananas only at serving time, so that they do not turn brown in color until you serve. 3. You can add the cream along with custard while blending it.